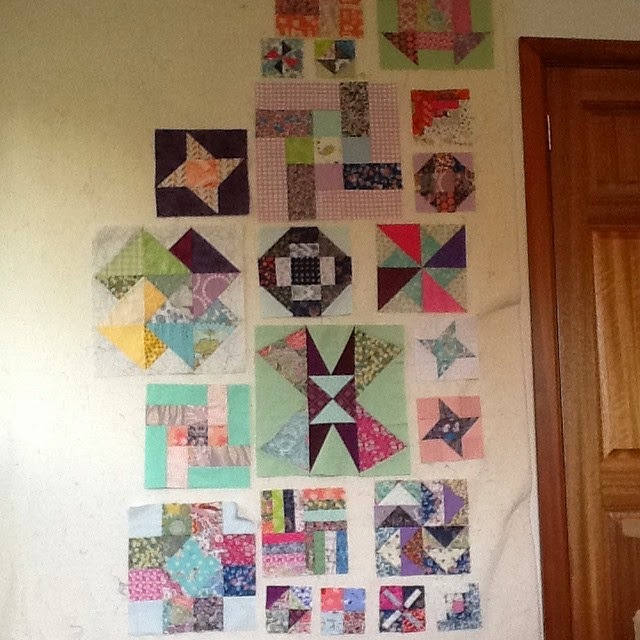 Two stars for Scraptastic Tuesday! Apologies for missing Tuesday - but we are still on holiday here and things work out differently like I sometimes even forget what day it is! Oops! All block names for this project come from the EQ6 block library so if you have the software you should be able to find the patterns in your block library - you can then print them and skip the drafting but it is a great skill to have and with these easy blocks it may even be quicker to draw your own! 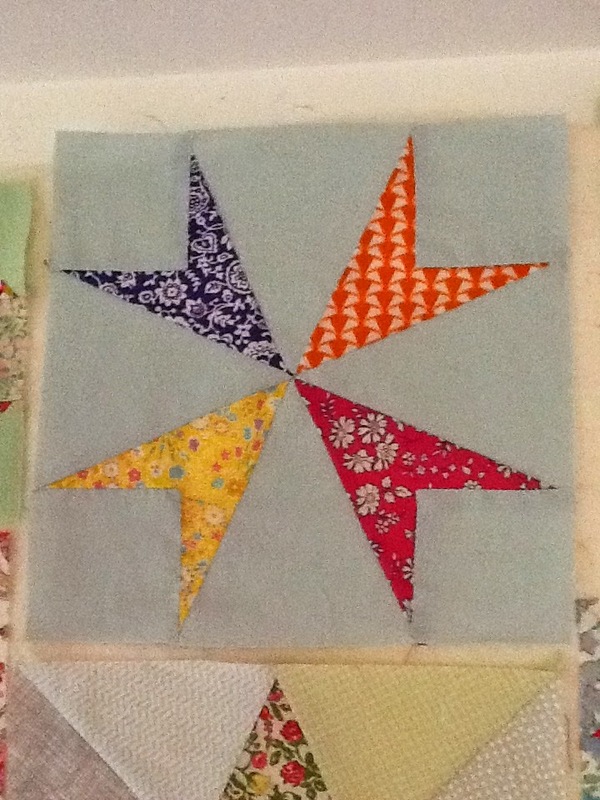 I used scraps for the star and the background - it is a busy, busy block on it's own but it doesn't stand out in the crowd ! This block has a quieter look as the background is the same throughout and a solid rather than a patterned print. 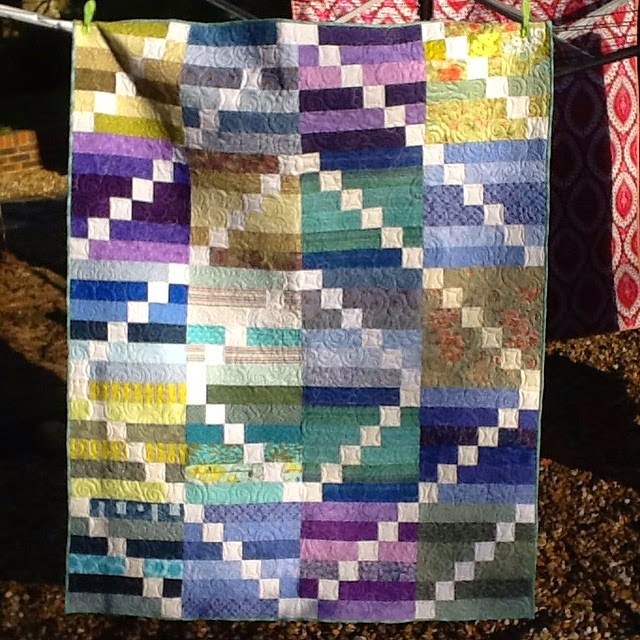 I love both these blocks and this sampler is a great way to test out whether I'd like to make a quiltful of blocks and to test out how to make them - as usual there are several ways to do it. 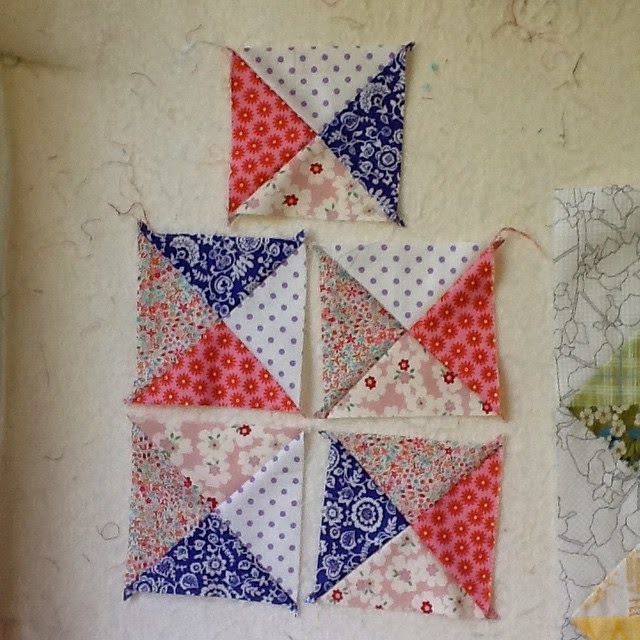 To start I drafted these blocks on paper - both are very easy! 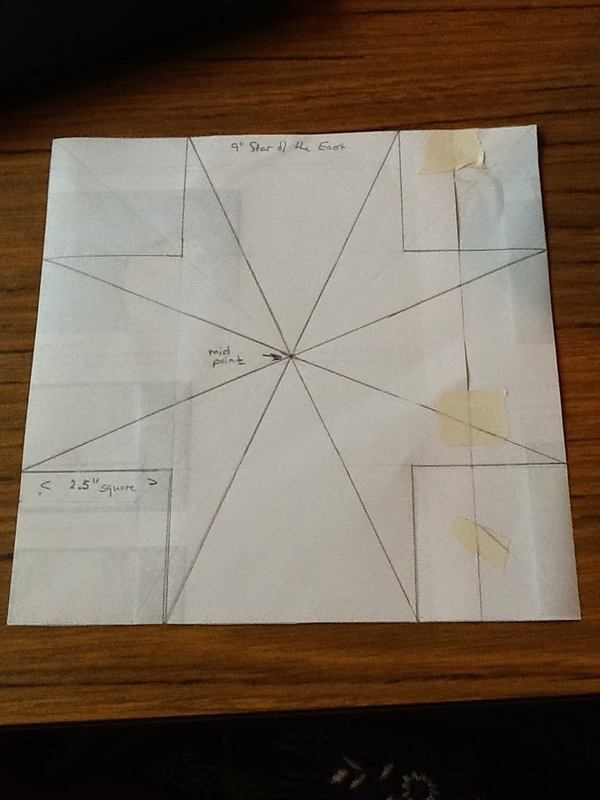 With a 9" square drawn on your paper (plain or squared) draw in the diagonals. 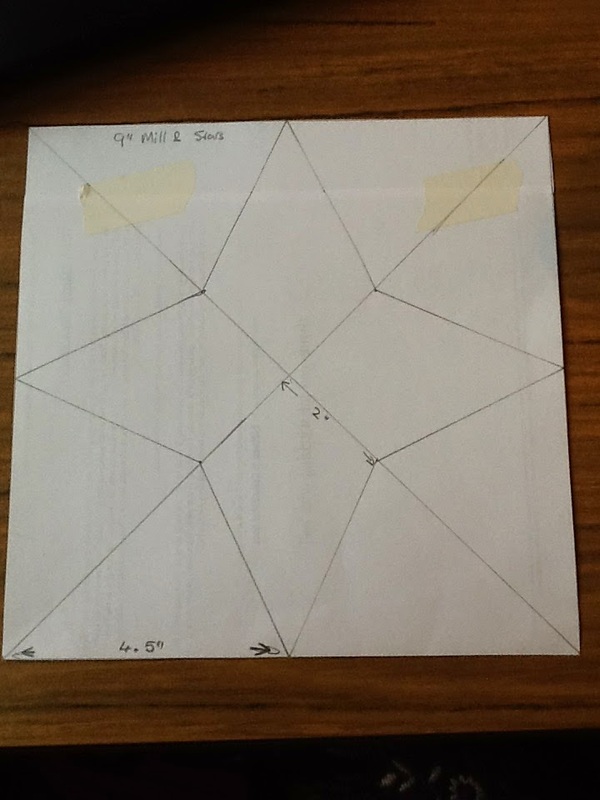 Mark the mid point of each side of the square - this will be the tip of your kite shape. Then make a mark 2" from the centre of your diagonal line and join up the dots ! Told you it was easy! Please note this pattern has no seam allowance marked. You may be familiar with this block as a strip pieced spiderweb block and of course it works that way to to use up lots of strips but also looks good using larger scraps. I cut the pattern in quarters on the diagonal and used my pattern to paper piece the Mill and Star block which is a great way to get those seams to match. Just remember that the pieces need to extend by a quarter inch on the outside edge. Alternatively you can redraw and add a quarter inch seam all around the pieces and use them as templates to piece together by hand or machine. 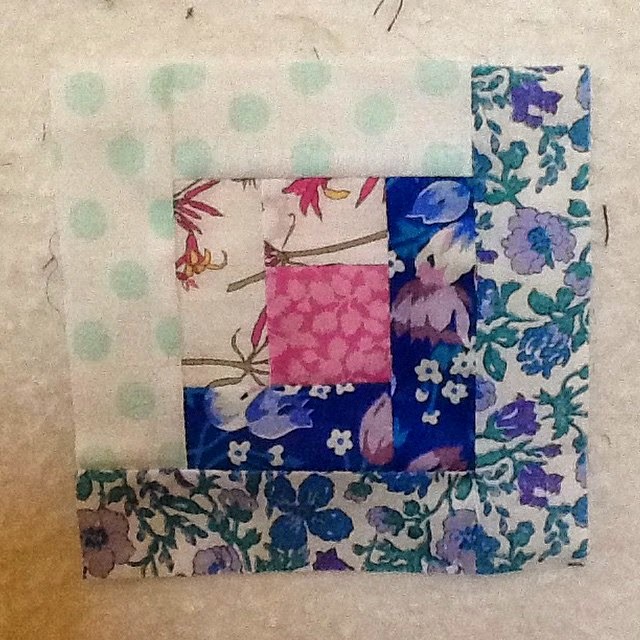 This block has a 2.5" square in each corner, which makes the rest of the block very simple to draw as in the photo. I have to say I decided it works well with a 2.5" square in the corner but you could of course change that and have a different look. Again no seam allowances (SA) are included. I redrew the shapes as templates adding a seam allowance - except for the square which with SA is 3". I machine stitched the pieces together (except for the squares) to form an odd half block - so background, star, background, star - then matched the centres and stitched by machine. The squares I added by hand, sort of appliqueing them on, tucking the seam allowance under. Not a classic way of proceeding but it works! 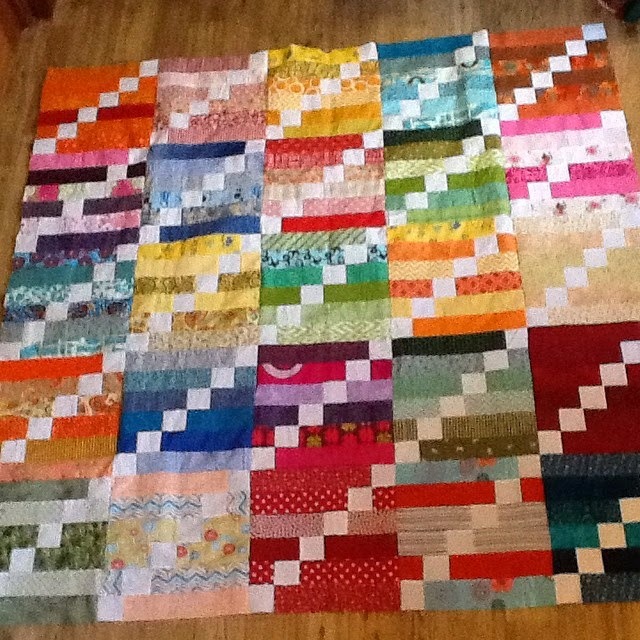 If I were to make a quiltful of these blocks I'd probably make them bigger and add extra seams in both the diagonals so the whole block could be machine pieced. 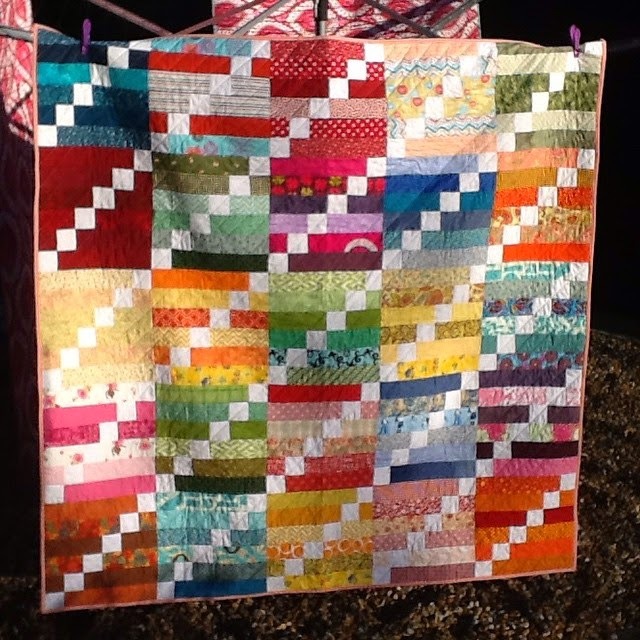 I know that Leanne has a great TaDa moment to show you - love that quilt Leanne and those kittens have grown up so much! Hope to see you next week, and as it will be back to school, I might even be on time! It seems like very little has been done in the sewing room recently - can't think what has been distracting me!? Not Christmas surely?? 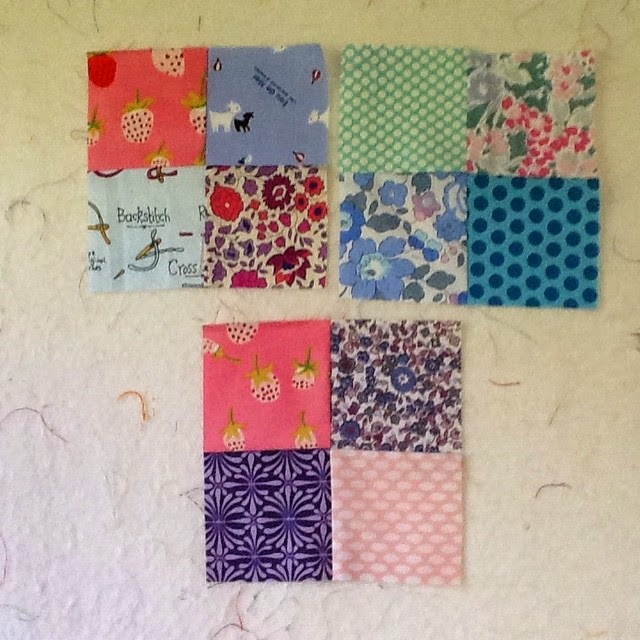 However I quickly made up a few 4" filler blocks for my Scraptastic Sampler Quilt. 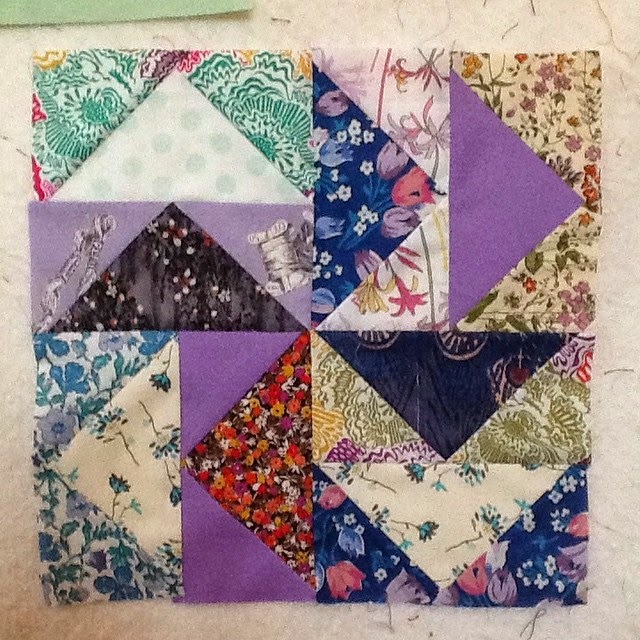 And hourglass blocks - made from 5" squares cut diagonally into quarters - mixed up and stitched together again - I only have four in my sampler plan but may manage to squeeze a fifth in somehow! What scrappiness are you up to this week? Wonder if Leanne has been scrappy too? There has been another exciting week of linkups, and I am trying to keep up with you all, but every time I look, there seem to be new links which is fabulous! Leanne and I are both delighted with your supportive response and the inspiration we are gaining from looking at all your projects, tips and plans! Thank you so much. We trust you are finding it as helpful as we are. Be sure to check out a few of the links yourselves! We will be emailing the winners once it is morning in Canada but feel free to email Leanne or I first if you read it here before we get to you, and then we can connect you to your prizes. Now what have I been up to this week apart from reading abut your projects? Well my contribution is just a bit of admin really. 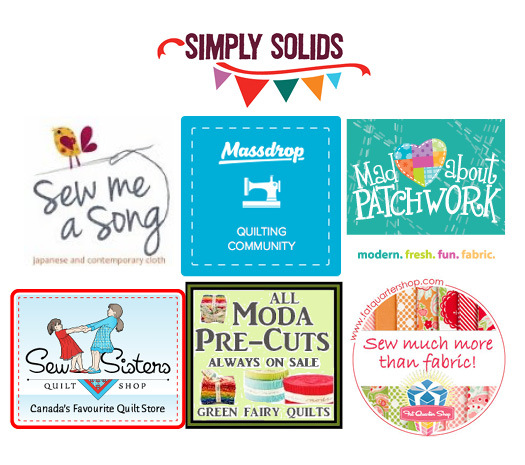 I have made quite a few blocks for my Scraptastic Tuesday Sampler and have set up a new page which will hold links to all my posts on this quilt for your convenience. I also reveal what it might look like! 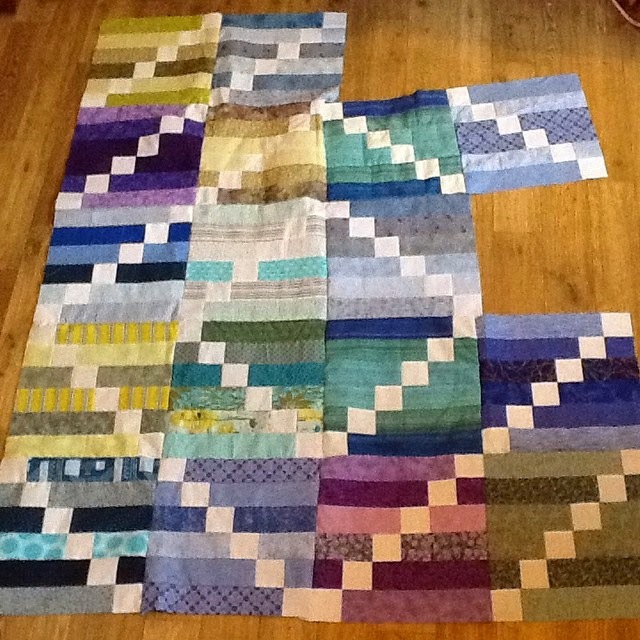 I cannot say it will definitely look this way as my quilts evolve as I make them but it will not be drastically different. Well a few more blocks are complete - especially larger/smaller sizes of the ones pictured here but I took this photo to check out how my first column looks an have only added blocks that nestle up to them. I just had to check out how they would fit together - more will follow - watch this space! Please join Leanne and I using your scraps over the next few weeks - use our button or tag your posts #scraptastictuesday. And come back to join us for the January Scraptastic Tuesday link on the second Tuesday, which will be January 13, 2015.
well the three all at once bit! Thanks to the lovely and generous Ayrshire ladies who attend my Bee Mate Sheila's classes and joined in so enthusiastically in making blocks for me to make three quilts for the Siblings Together charity. The pattern for this block is available here. Thanks Sarah for writing that up. 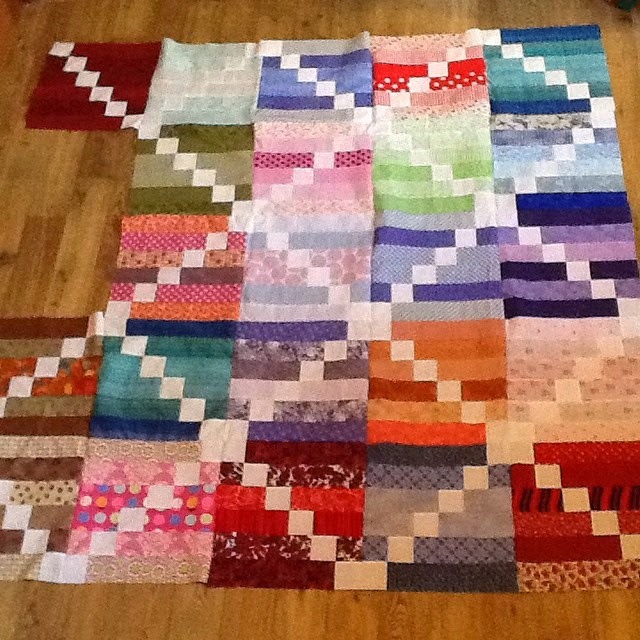 I will be making more quilts for this charity with different patterns and if you want to help by making blocks be sure to let me know. I'd like to have a great big pile to hand over - the charity does such a necessary job of keeping children in the UK care system in touch with their brothers and sisters. This week I got back to making more sampler blocks. I was grouping my blocks by design at the beginning, but I wasn't far from completing a column of blocks so I have worked on the ones that were missing. It gives me a better idea of how they will all fit in together. I may be doing a bit of rearranging as my blocks at the bottom seem very busy but as I've kept to a few sizes they are easy to swap around! Cut eight 5" x 2.75" rectangles, and sixteen 2.75" squares. 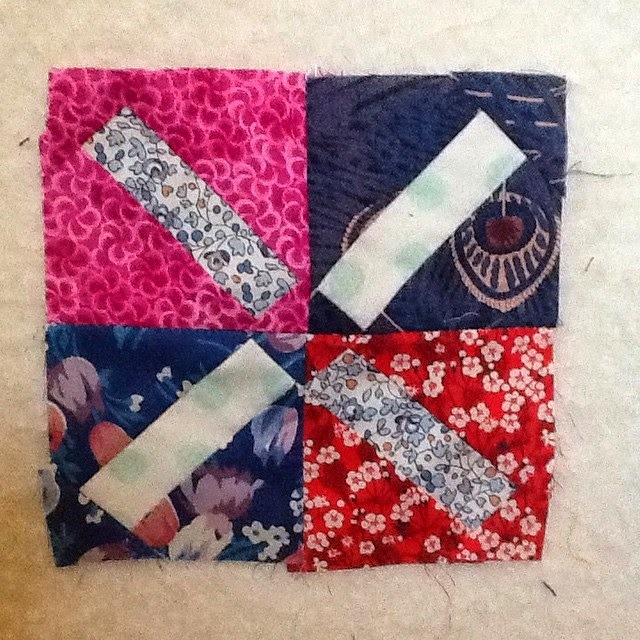 Place the squares in the corners of the rectangles, stitching diagonally across the square to make a goose - or use your own preferred method. Make eight units and stitch in pairs - one goose on top of the other. Then combine the paired units being careful to orient them as in the photo! Cut four 2.5" - cut in half diagonally. Insert a 1" strip between the triangles matching on either side. Trim to a 2.5" square. Cut eight 1" squares in the background fabric. Place at either end of the strip and stitch across the square diagonally so that when flipped back it completes the square. Cut the excess off and trim each section to 2.5" square. Stitch the trimmed squares in pairs, and the paired units as in photo. So it is the second Tuesday of December and it's time to linkup - what already? Doesn't time flash by when you need it to stand still...? 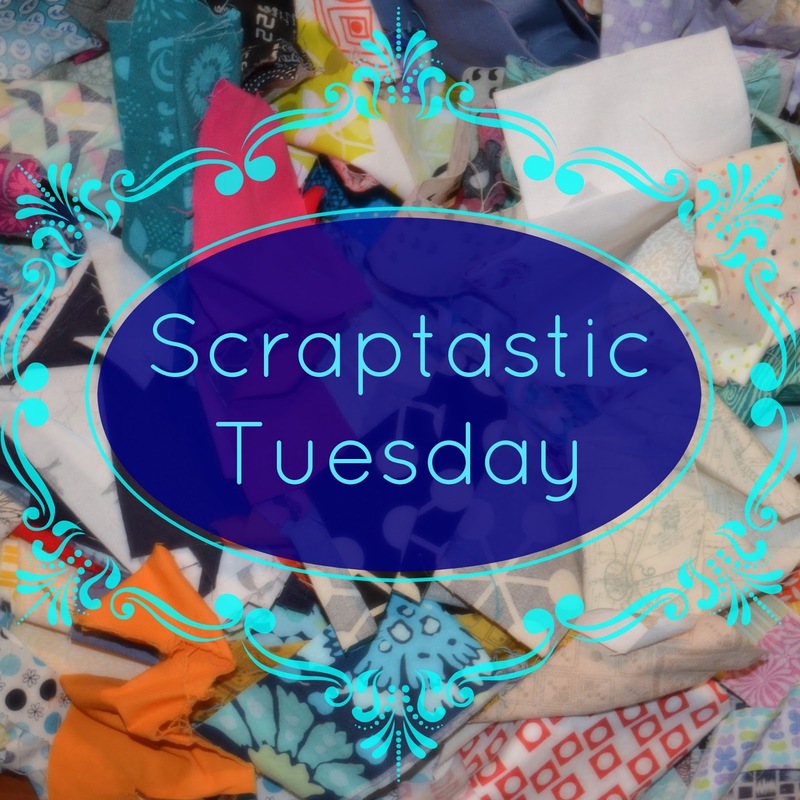 Please join Leanne from she can quilt and I for the monthly Scraptastic Tuesday link. Link up a blog post, flickr picture or instagram photo showing off a scrappy project, new or in progress, or your thoughts on dealing with the scrap mountain. You can link from a post or photo from anytime over the last month. Please link only one post per person. 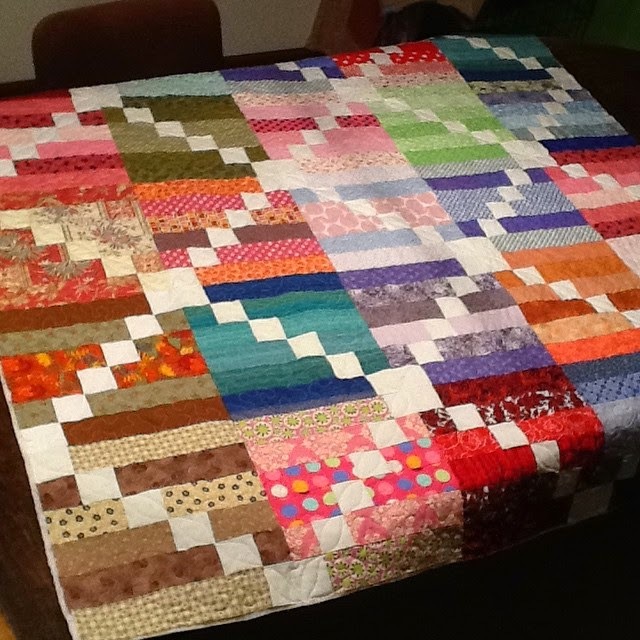 You can link here or on Leanne's blog - she can quilt - the link is the same on both blogs. The link will stay open for one week, closing at 10 pm MST on December 15 so that we can announce the randomly drawn winners next Tuesday. Please visit as many of the links as you can, and leave a comment too, so that everyone gets know each other a bit in this link up. I've been finding these links very inspiring to visit and I am sure you will too. Good luck everyone and I hope you are up to date with your Christmas shopping! Woops where did ScraptasticTuesday Go!? I really don't know where the time is going but I do suspect it is something to do with those shorter days. I should have been reporting on Scraptastic Tuesday on .....well ThursTuesday! Sorry for the delay.. Anyway I have been working on some scrappy projects this week and was trying to finish them. Still a bit to do so here is an interim report. My scrappy tops for the fabulous Siblings Together charity have been sitting around for a while as I have been deciding how to back them. As the top is all scrappy I decided to push the boat out and buy backing yardage. I found a bolt of Amy Butler Imperial Paisley on ebay and snapped it up. 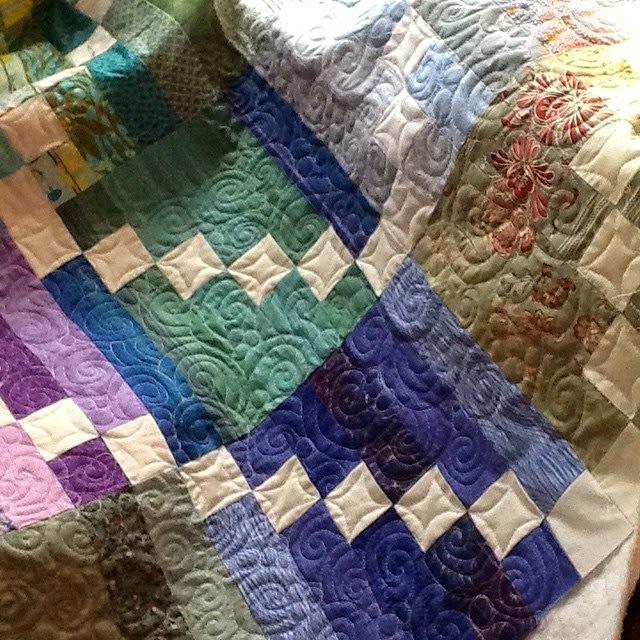 It is one of the factors which unites these three quilts. Another is that the majority of them were provided by some lovely Ayrshire ladies who attend classes with my bee buddy Sheila @ Bluepatch Quilter. 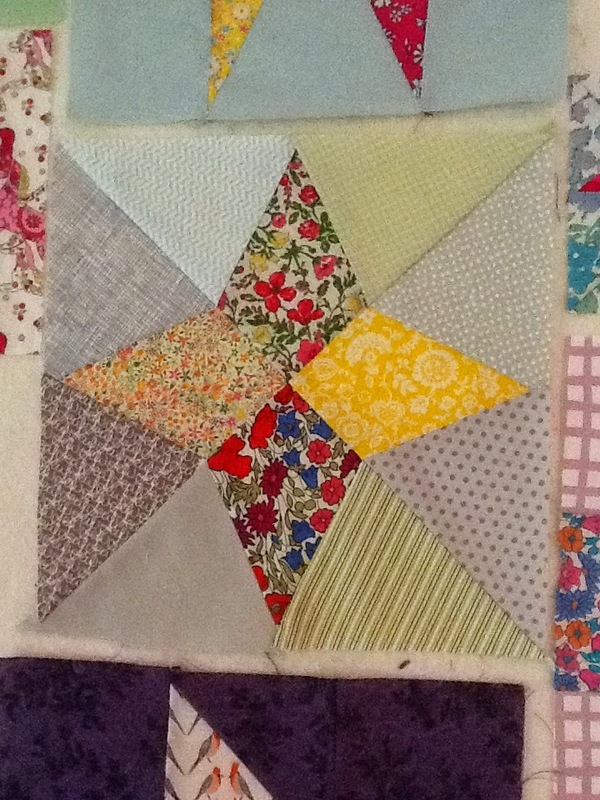 And one more is the block to make all three quilts although they are arranged in different layouts. You can just catch a glimpse of my backing fabric in the photo below, bottom right corner.. 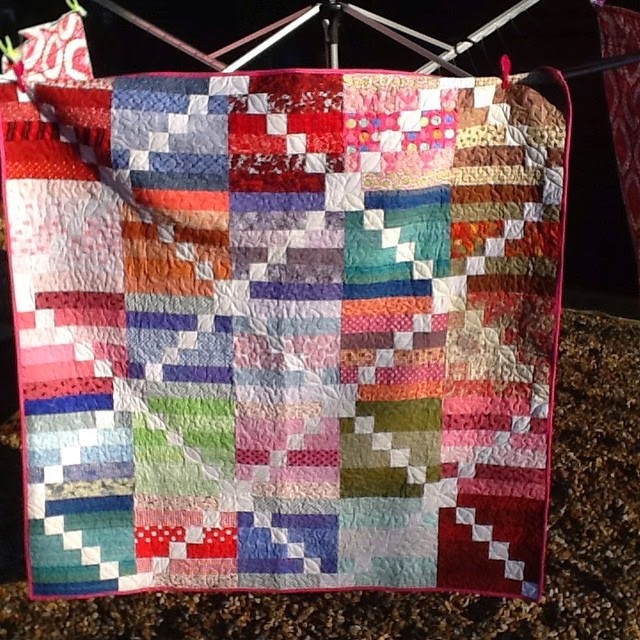 I have quilted each one in a different way - well quilting 'girls just wanna have fun ' don't they!? 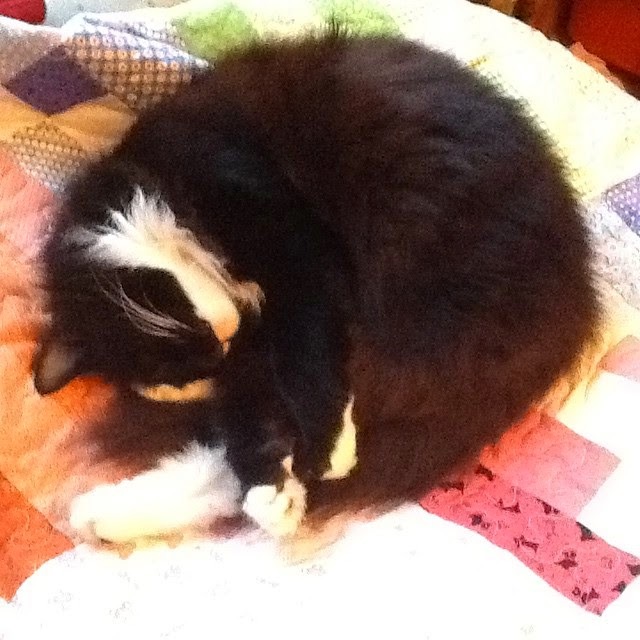 Our cat was assisting with the quilting - she is clever that way! She makes a great quilt weight! 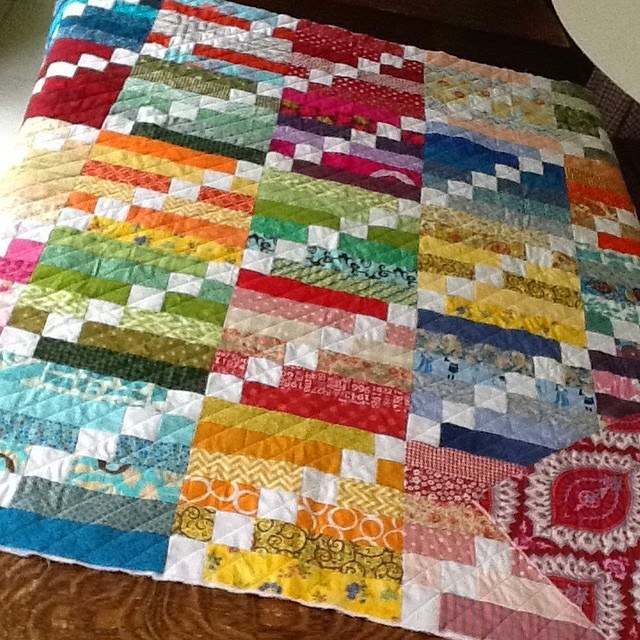 It was quite effective in stopping my quilting marathon today! Though I am late in posting about Scraptastic Tuesday this week please remember it is our link up day next Tuesday 9th December. You will have a week to link up and there will be some lovely prizes! Now I would normally tell you to check out what Leanne has been scrapping up but I think she is a bit behind too - wonder which day will turn out to be her Scraptastic Tuesday? Now get scrapping in time for next Tuesday!